Some blueberries were still left with me after making virgin blueberry lemonade. December means its the season of one of my favorite fruit, Orange. That may be orange or lemon, I just love all citrus flavors. 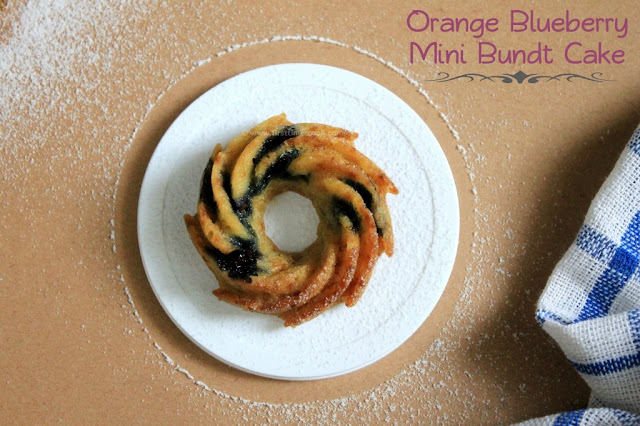 So the thought of making some mini bundt cakes using these two fruits, blueberry and orange came to mind. These mini bundt cakes are lightly sweetened. Also I have prepared using whole wheat flour, which gives a healthy option. These are totally egg free and vegan as well. The blueberries used here are frozen ones, so I just have mixed with batter without thawing blueberries to avoid discoloring the batter. And if using fresh ones, then just first roll with some flour and then only mixed in batter to avoid sinking to bottom. Instead of mini bundt molds, any other muffin molds or paper cupcake liners can also be used. 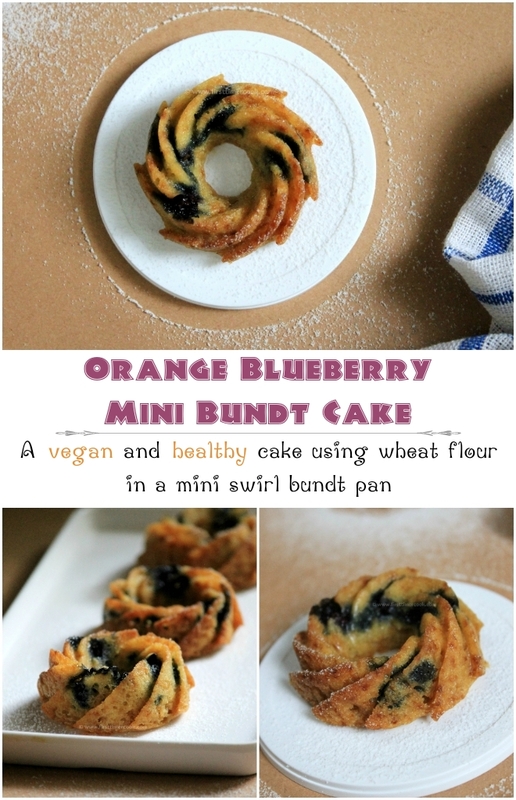 The vegan orange blueberry mini bundt cakes are easy to make and delicious for breakfast or as an afternoon pick-me-up. Much tender, moist, healthy mini cakes; what-else one can need for Christmas party!!! 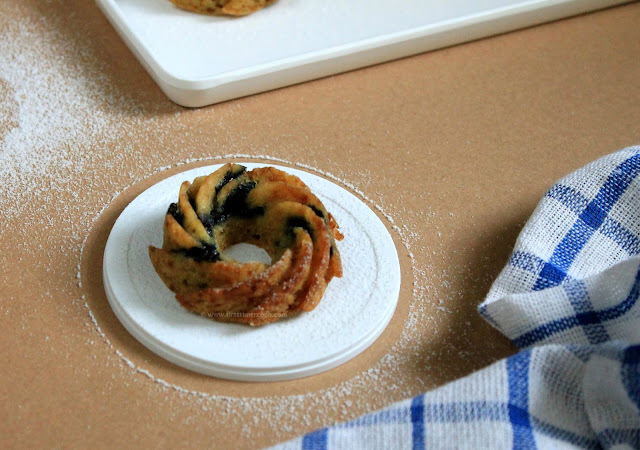 Below is the details method of preparation of these vegan orange blueberry mini bundt cakes. Preheat oven at 180 deg C.
Grease the mini bundt pan with oil and keep aside. In a mixing bowl, first take sugar and oil. Mix well. Next add orange juice and mix until sugar dissolves completely. Meanwhile in another bowl, sieve wheat flour, baking powder, baking soda, corn starch and salt. Keep aside. Add fresh orange zest in the wet mixture and give a quick stir. Then add the sieved dry ingredients with the wet ingredients, mix gently till everything incorporated well. Now add blueberries in the batter and gently again mix evenly. Pour in the greased mini bundt pan and bake for 25 minutes or till a knife / toothpick inserted into the cake comes out clean. Take out from oven and allow to rest for 10 minutes. Then invert and allow to cool completely. 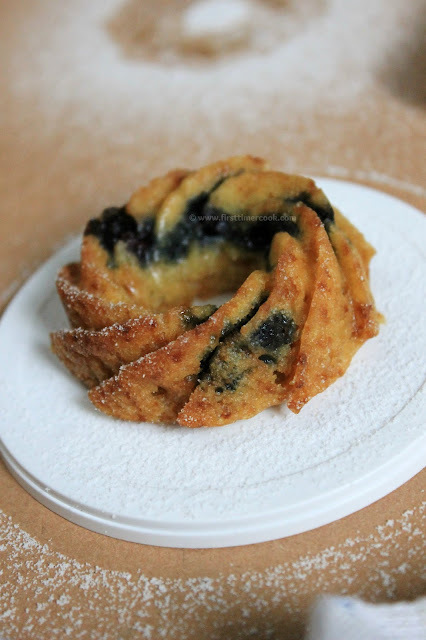 Serve these vegan orange blueberry mini bundt cakes by dusting some powdered sugar or simply as it is ! If mini bundt pan is not available, then just go with normal muffin or cupcake mold. 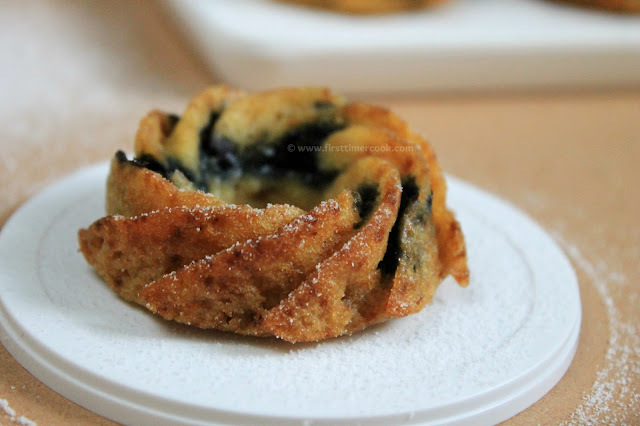 If using frozen blueberries, then use without thawing to avoid discoloring the batter. And if using fresh ones, then just first roll with some flour and then only mixed in batter to avoid sinking to bottom. Sending this recipe to Fiesta Friday this week co hosted by Mollie and Petra. I love your little mini bundt cakes! They're just darling! Thanks for sharing at Fiesta Friday! Hi, Flour used here is whole wheat flour which is mentioned in the ingredients table. 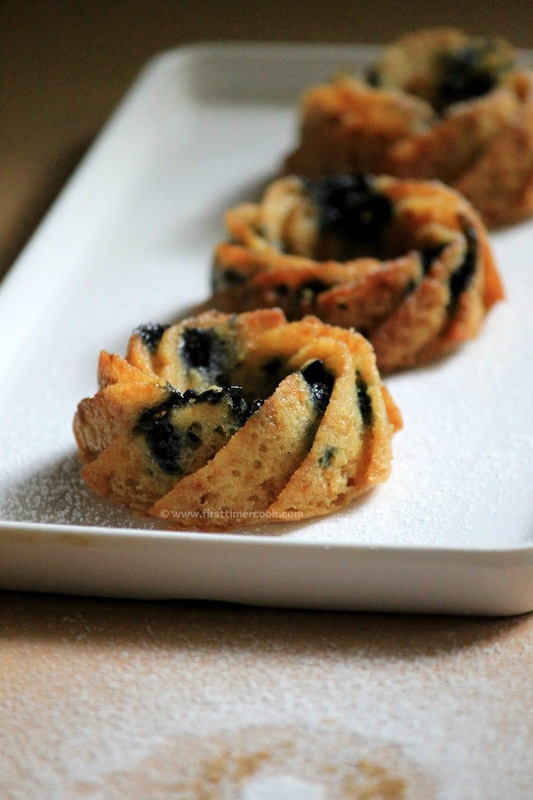 These mini bundt cakes look so good, love the flavours in there of blueberry and orange. Awesome.